We are offering sophisticated traditional experiences like geisha play, tea ceremonies, Japanese old style singing and so on for 8 years. 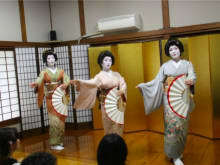 We have long based its activities in Kagurazaka which has been one of the famous geisha towns since Edo era. Great experience!! I have been living in Tokyo for 26 years, but I had never seen Geisha play in my life. Geishas show me a delicate movement every second. I had a luxury weekend to touch Japanese traditional arts.